This, That, and T'other: Completed Project! One day shortly after we were married, my husband surprised me on my return home from work. . . with this. It was a thrift store bargain, and he knew that I had wanted a rocking chair for quite some time. It had very stained blue cushions. When a neighbor got rid of their broken rocking chair, we acquired the green cushions. However, the foot stool still looked like this. For awhile, I have been wanting to buy some fabric and recover the cushions. Last week, my trip to Wal-Mart turned up some navy homespun for 2 dollars/yd. So, on Tuesday, after my fever broke, I tackled this project. 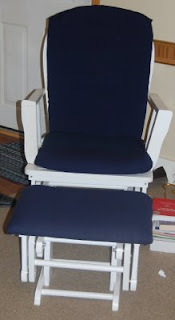 Here is the completed rocker. It looks ten times better. And it even matches our curtains. Very cute!! I could never do that! You are one talented lady! Thanks for comment on my blog! I am still running a low grade fever but i've been resting so hopefully I'll be feeling better soon!! The cushions look great and matches your beautiful curtains so nicely!!! That is ADORABLE!! I love the dark blue with the white. It's so pretty! You are a very talented lady! Wow! You did a great job. It looks so fresh cute now! Wow it looks so wonderful! It makes me think of how many times I've passed up a chair that I probably could have done something with.